If you’re a cat lover, then your tendency when you see a stray kitty would be to entice it with food and treats. That is understandable, given the overflowing cuteness of these furry critters. Nonetheless, hang on with the feeding. Do you know that in some areas, it is prohibited to feed strays? Yes, you could get arrested or fined! Besides that, is the food you’re going to give safe for our feline friend, considering its living conditions? Moreover, do you know exactly what to do if you find a stray cat? The answers to these questions are discussed in the article, so keep on reading. So Should You Feed Stray Cats? If there’s an ordinance in your area that says you can’t, then the answer is NO. But on other cases, our answer to the above question is a NOT a resounding yes! This is a controversial issue and there are numerous people for and against feeding strays. Most of the animal welfare organisations would instruct you not to feed stray cats, and they’re not completely wrong. The reasons for feeding are very simple; you just don’t want the kitty to be hungry. If you feed the cat, it’ll be happy and thankful. You would feel great too! But there is a bigger picture. One popular reason discouraging feeding is that it will encourage strays to breed out of control, which will lead to bigger social issues. The counter argument to that is the cats can breed out of control whether you feed them or not. But the healthier the cat is, higher the chances of reproduction. If they reproduce, the kittens are not going to have a happy life either. They will potentially live a life of starvation, just like the other stray cats that we see around. In the place of one stray cat, you’ll have to feed five tomorrow. Another reason given is that by feeding strays, the uneaten leftovers may attract other wildlife like raccoons, rodents, and possums etc. You can remedy this by knowing the correct food to put out in feeding and by not throwing out the food on to the ground. All being said, everything depends on whether you want to contribute to the problem or want to be a part of the solution. The solution being adoption or letting any local animal shelter take care of the cat. It is worth considering if the cat is truly a stray cat though. If the cat is owned by someone nearby, then they may not wish for you to feed it. Before putting out any food for the cat, ask your neighbours if it is their cat and if they mind. They might be trying to get the cat to lose weight, or it may be diabetic or have a disease like kidney disease, which requires a very specific diet. Therefore feeding a cat which is owned by someone, may actually be very detrimental to their health, and in the end, the welfare of the cat should be above your need for having a lovely cat around. If you are confident that the cat is not locally owned and it is in need of some food, then continue reading this article for some advice on your options. What To Feed Stray Cats? Now to responsibly feed strays and avoid other wildlife, you can put out dry food or canned cat food. While you can give canned tuna, your best bet is still to go for dry food or canned cat food. Why? Largely because these kinds of food don’t normally bring out the other wildlife. Since feral cats are naturally nocturnal, you can safely put out canned cat food at night. Don’t forget to leave lots of fresh water for our fluffy friends! While these cats are definitely starving and will eat anything you put out, ordinarily our feline friends hunt in our natural environment. What To They Usually Eat In The Wild? While outdoors, our feline friends mostly prefer small rodents and birds. These include mice, rats, sparrows, and robins. To be truly full, cats munch on anything they can catch, even insects and reptiles. Lizards, spiders, and grasshoppers contain vital nutrients. For drinking water, strays favor natural rainwater that can be found in potholes and puddles. Felines have a higher sense of smell than humans, 14 times higher to be exact, so preservatives found in water are irritating to them. Besides these, cats likewise feed on fresh prey. Felines eat up everything including the prey’s skin, feathers, organs and even bones. Note though that out in the wild, cats refrain from eating plants such as grains and vegetable. Like most cat lovers, by now you have grown accustomed to your furry friends. If you have exhausted all your efforts but still unable to find the owner, then consider adopting, surrendering to a humane society, rehoming, or lastly TNR (Trap-Neuter-Return). Prior to adopting strays, consider scheduling a trip to your vet first before letting the cats into your home. This is an excellent opportunity for the vet to check whether the cat has a microchip which is registered to an owner. Since these felines were outdoors for a time, it is highly possible that they have picked up fleas, ticks, and other crawlies. The vet can prescribe some anti-parasite treatment for the cat. At the same time, it is best to give the cats de-worming medications and vaccinations. Have the stray neutered too if what you have is a tomcat. More than the trip to the vet, you should also be ready to help the strays adjust to living inside or outside your home. These include using the litter box and socializing the adopted strays with other cats and people. Although you may contact your local shelter, unfortunately, most shelters are already housing too many animals. At times, shelters are forced to euthanize strays because there aren’t enough available homes. However, hopefully they will be able to place your stray for adoption. 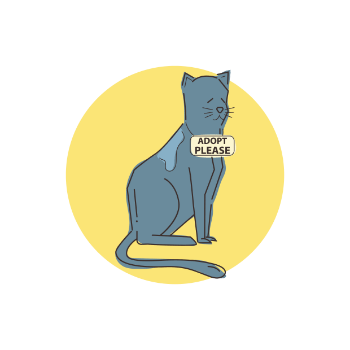 If you’re not ready to adopt then consider rehoming your stray. This is of course, after taking them to the vet to check for a microchip and their general health. The safest option is to find for yourself a suitable home for your cats. You may ask around from friends, family, or co-workers who might be looking for a cat. Check with rescue organizations as well as they might know others who may be able to help you. Aside from these, you may also opt to advertise locally or through the internet. Bear in mind though, to carefully screen people when rehoming and never offer your cat for free. It is not ethical for you to be making a profit from a stray cat, but a small price will cover the costs for your trip to the vets. In doing this you’ll draw out people who sell pets for animal fighting, bait or who wish to sell on to make a profit. When adopting and rehoming is not possible, find out if your community or vet is involved in TNR. This strategy requires humanely trapping outdoor cats, spay or neuter, then return it to its area. Take note that before returning the strays to its natural habitat, these felines should have already been given a health check and proper vaccines. Spaying and neutering at the right age are likewise necessary so that these cats are no longer reproducing. TNR considers too the level of socialization of each cat. Socialized felines and kittens are allowed to be adopted. While for adult feral cats, these cats are brought back outdoors. Eventually, in time, its colony size will decrease. You can recognize sterilized or TNRed cats through its clipped ears. Ear clipping makes it easy for caretakers to identify sterilized cats to avoid re-doing the surgery. How Do You Differentiate Stray And Feral Cats? Stray cats simply mean cats that were once domestic pets but for some reason have become abandoned or lost. These are socialized cats, however, once they lose their homes, they also lose human contact and dependence. However, feral cats are wild animals with no human contact. These cats survive by hunting food in the environment, all by themselves. They are usually born into the wild. Both cats typically may appear dishevelled, unhealthy, and with rough fur. The difference lies in how the feline will interact with people. A stray cat will most probably come near people, houses, porches, or cars. On one hand, feral cats will avoid doing this and will most likely avoid people. As stray cats were once housed pets, it similarly moves and walks like one. You might observe these felines walking with tail up, its gesture of friendliness. Additionally, you might notice that these cats make eye contact and may in time allow a little bit of touching. Whereas, you’ll see fearful feral cats crawling, crouching, and staying low to the ground. It has the likelihood to protect its body with its tail, avoid eye contact and touching. When it comes to other cats, a stray cat is prone to solely live on its own and not likely to join a group. Whereas, you’ll see feral cats belonging to a colony. In any case, stray cats generally roam during the daytime. Rarely do feral cats go out during the day, and these types are commonly nocturnal. It may be difficult to recognize these two once trapped or scared. Frightened strays will need time to relax to show its degree of socialization. You may be asking, why is it important to differentiate? It’s because stray cats can readapt to living with people and afterward be adopted as house pets or companions, in case you want to do more than just feeding stray cats. Unfortunately, adult feral cats cannot be adopted. It is better for these felines to live outdoors than be brought to shelters where most likely it will be euthanized. Fortunately, feral kitties can still be socialized at an early stage and may possibly be adopted as pets. Knowing the proper food to feed strays enables you to avoid drawing out other wildlife which you don’t want. While providing food alleviates the stray’s condition, these felines need more help than that. Once you have confirmed that the strays you have are not someone’s pets, then, consider your next step. You can opt to adopt, surrender to a humane society, rehome, or lastly TNR (Trap-Neuter-Return). Though before you do the first three options, it is best to visit your vet for vaccines and other proper treatments. Each of the given options is not easy. You will most likely encounter many challenges in doing them. Nevertheless, taking any step is better than taking none at all. Ultimately, what is essential is that our furry little friends are able to live its best life possible.